Khizr Khan's message to Donald Trump was the most damning moment of DNC. Khizr Khan, father of deceased Muslim American soldier Humayun S.M. 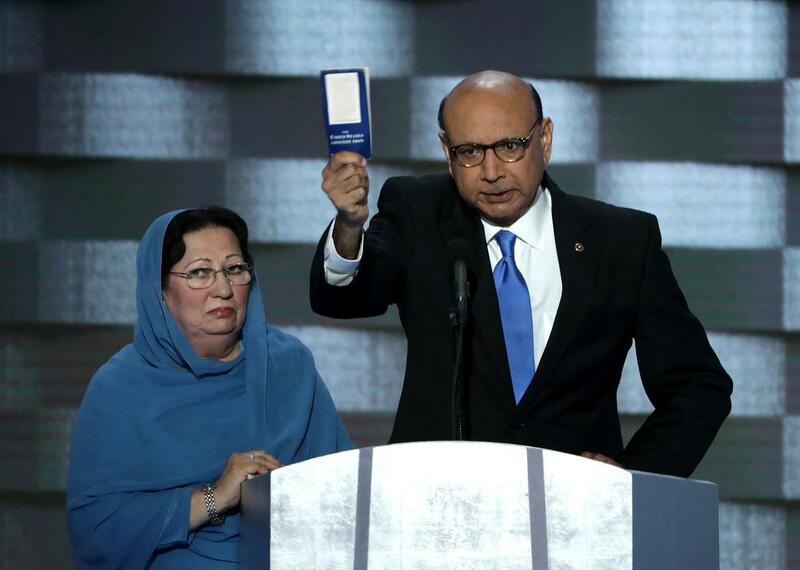 Khan, holds up a booklet of the Constitution, offering it to Donald Trump. One of the finest and most damning addresses of the Democratic National Convention was delivered on Thursday night by one of the event’s lowest profile speakers. Khizr Khan addressed the Philadelphia crowd to recount the story of his son Humayun Khan, a Muslim American soldier who was killed while serving in Iraq in 2004. Khizr Khan painted a portrait of heroism, patriotism, bravery, and sacrifice—one that stood in stark contrast to the invidious message Donald Trump has issued to describe American Muslims and the unconstitutional religious test he has offered to bar Muslim immigrants from entering this country. Quite simply, Khan put Donald Trump to shame. Humayun Khan was born in the United Arab Emirates and immigrated to the U.S. as a small child, growing up in Maryland and attending college at the University of Virginia. He was a 27-year-old Army captain when he was inspecting the gates of his camp in Baquba, Iraq, and a speeding vehicle approached. Khan told his fellow soldiers to hit the ground and he signaled at the vehicle to stop. He took 10 steps toward the vehicle, which had in it two suicide bombers and a large amount of explosives. The car exploded, injuring 10 of his fellow soldiers and killing Khan. The captain was posthumously awarded the Bronze Star and the Purple Heart, and Khizr Khan believes his son’s actions saved the lives of many of his fellow soldiers. In the convention hall this message was pointed sharply at Trump, who has called for a full ban on Muslim immigrants (he recently said the ban would be based on specific territories, but his campaign has said his position hasn’t changed). After the Orlando attack, Trump also accused Muslim Americans broadly of refusing to expose terrorists in their midst. Khan’s message to Trump was more damning than anything delivered by any previous speaker at the DNC thus far. “Donald Trump, you are asking Americans to trust you with their future. Let me ask you: Have you even read the United States Constitution? I will gladly lend you my copy,” Khan said, pulling out a pocket Constitution as the crowd erupted in applause. It was this moment that should make every Republican politician who opposes that Muslim ban and still supports Donald Trump to feel a sharp, stabbing sense of shame.